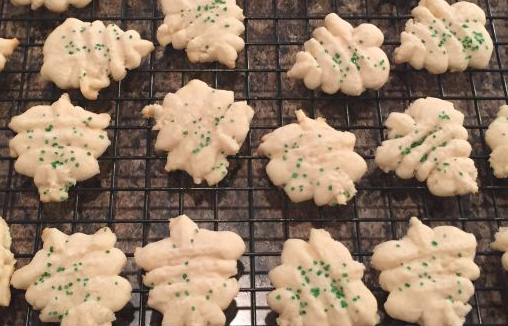 I love making spritz cookies – these are the kind of cookies you make using a cookie press. They’re pretty easy to make. It took me a while to get the hand of the cookie press. I’ve been making them for years now, but I have to admit that at first – my spritz cookies really didn’t resemble anything. They just kinda looked like blobs. Now, the first few years I made spritz cookies, I make plain ones. Then I discovered this recipe. I never looked back. They’re so good. I love just the little extra twist it adds to the little cookies! When you make these cookies, you don’t have to do anything else to them, but I like to decorate them with colored sugar. It just gives them a touch of color that makes them extra Christmas-y!